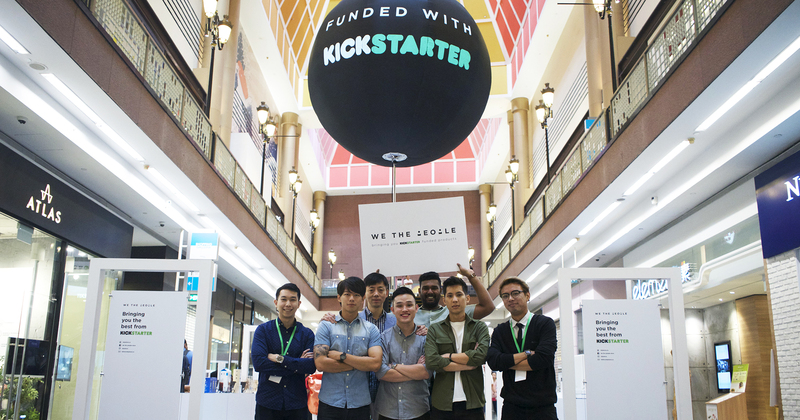 Kickstarter projects, while niche, aren’t completely foreign to Singaporeans. From local hits like a politically incorrect, Singaporean-esque nod to Cards Against Humanity to a highly successful, yet extremely understated watch, Singaporeans are both active consumers and creators on the platform, the latter spurred on with the launch of Kickstarter on our shores. However, while the beauty of Kickstarter is that consumers can feel more involved in the process as compared to buying a ready-made item off the shelf, there are many times that projects fail to deliver on time. One of the recent local examples was the WOLO Life Clock, which, after raising over $30k, went radio silent, causing a stir among backers. The creator finally emerged after Mothership covered the fiasco, admitting that he failed, and that he had, so far, refunded 70-80% of backers their funds. WOLO’s isn’t an isolated case. There may be massive success stories stemming from the platform, but there are also times when projects either don’t arrive on time, or don’t arrive at all. This is where We The People, the team of Singaporeans who have found success in two brick-and-mortar stores bringing Kickstarter favourites offline, wish to come in. 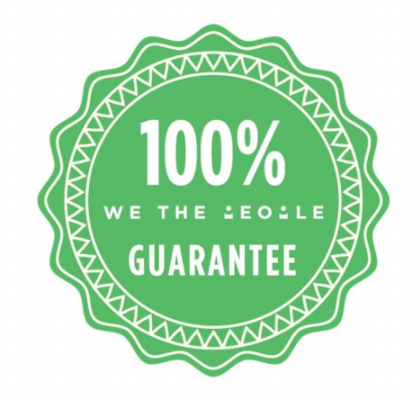 The team has just launched a brand new initiative, the “W.T.P GUARANTEE”, which aims to give backers 100% refunds if a project fails to deliver on time. Touted to be a world-first, the team will have campaign creators undergo a strict curation process before they can use the guarantee on their campaigns. I spoke to Ryan, co-founder of We The People, and found out more about the new initiative. What are your motivations for starting this? 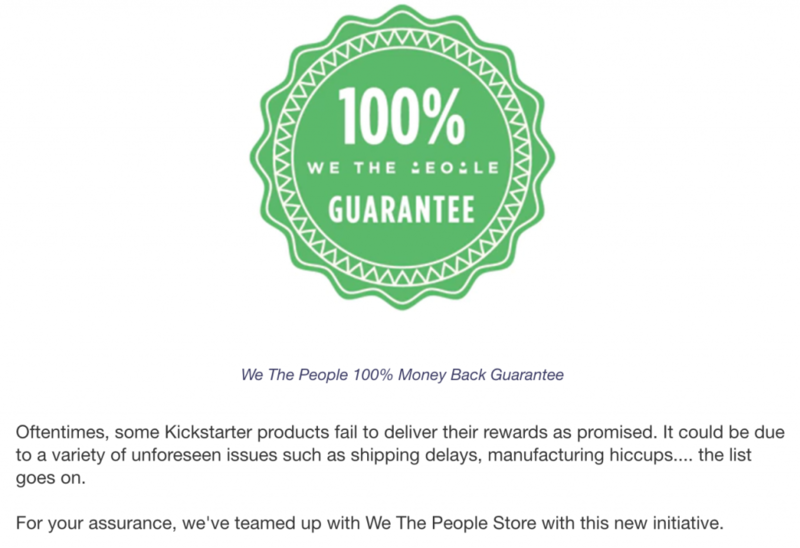 Did Kickstarter backers come to you with complaints? Statistically, 7/10 projects fail to deliver on time. Even worse however, is when they completely go MIA. I’ve personally encountered a couple of customers who started venting on me, haha! Some notable flops are: Coolest cooler, WOLO life clock, Peachy Printer, Pirate 3D… the list goes on. A large portion of our customers have backed campaigns and never received their product. It’s really sad. Some of these campaign owners just stop responding and posting updates altogether. We saw an opportunity to fix this and give backers added assurance. For creators, it would mean campaign credibility and would therefore equate to a potential better funding. How are you trying to get the creators on board this initiative? We’ve been advocating the use of Kickstarter for crowdfunding ideas for a while now and we’ve got quite a large community who want to create their own campaigns. We’ve worked with some of them for our “live funding”, where we’ll place their prototypes in store during their Kickstarter campaign to allow the offline crowd to touch, feel and learn more about the product/brand before becoming a backer. We did this for Limpeh Says, where we hosted quite a few games in store. It’s something you just can’t do online. So right now, quite a bunch of soon-to-be creators have reached out to us to work together. They have all been very positive about the initiative. We’re going to launch a mega collaboration of 6 campaigns in June, all of which will have the “W.T.P Guarantee” and will have physical prototypes in our stores for the consumers to try out. How would it benefit the creators? Once the guarantee is in effect, they can expect to see a rise in backer numbers during their campaign. At the end of the day, credibility and trust is what sells. Especially in crowdfunding where proving credibility can be very tricky. W.T.P will be a objective third party that will make sure backers get what they backed for. What should those looking to back a project with the guarantee know about? Potential backers need to know and agree to a timeline of delivery provided in the campaign. They will need to fill up a quick online form that collects basic particulars (PDPA applies) and will receive a confirmation email of the guarantee after. If, should things go south and they don’t receive what they pledged for within the stipulated dates, they can then apply for the refund, which will be processed by W.T.P. Does the official Kickstarter team know about it? Kickstarter knows about this as there already is a live campaign with the guarantee – before you click on launch campaign, Kickstarter will have to curate your campaign write up first. However, we have not officially contacted them with regards to the guarantee. It’s in the pipeline though. Currently, the initiative is live on the page for XAWUNT, a 4-way converting bag, and Ryan reveals that the guarantee would be valid both local and overseas campaigns. For those who’ve always wanted to try backing projects, but never did so because of the uncertainty, the Guarantee would definitely boost their confidence in taking the leap.